An inlay restoration is a custom-made filling made of composite, gold or tooth-colored porcelain. It is made by a professional dental laboratory and is permanently cemented into the tooth by Dr. Simone. Onlays can be utilized to conservatively repair teeth that have large defective fillings or have been damaged by decay or trauma. Onlays are an ideal alternative to crowns (caps) because less tooth structure is removed in the preparation of onlays. Onlays are essentially identical to inlays, with the exception that one or more of the chewing cusps have also been affected and need to be included in the restoration. 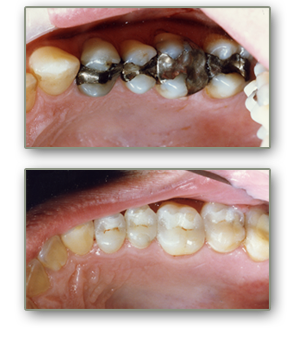 As with most dental restorations, inlays / onlays are not always permanent and may someday require replacement. They are highly durable and will last many years, giving you a beautiful long-lasting smile. While the tooth is numb, Dr. Simone will remove any decay and/or old filling materials. The space will then be thoroughly cleaned and carefully prepared, shaping the surface to properly fit an inlay restoration. A temporary filling will be applied to protect the tooth while your inlay is made by a dental laboratory.